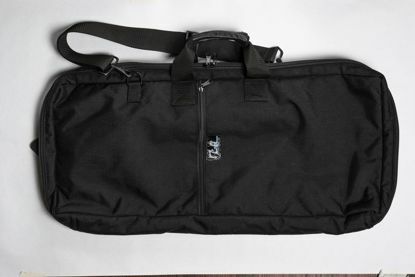 Bassoon carryall, made of black Cordura, with handles and removable shoulder strap. Case fits in a polyester sheepskin-lined compartment. It has a separate accessory compartment as well as a music compartment large enough to accommodate orchestra folders. It measures 28 x 12 x 4". 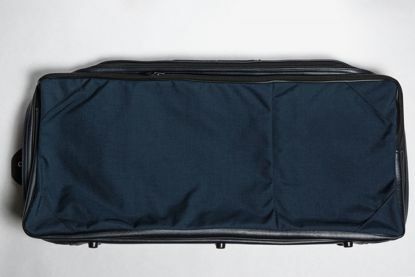 Bassoon case cover made of blue Cordura, water repellent to fit Heckel case. Has full-sized pouch divided so that 3/4 of the pouch is available for music and the rest for tools. Interior is also made from Cordura with 1/2" foam for insulation and cushioning purposes.